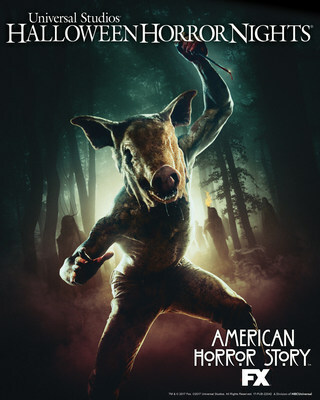 Universal Studios Hollywood announces the return of FX's critically-acclaimed, Emmy® and Golden Globe® Award-winning television series "American Horror Story," bringing Ryan Murphy's demented "Roanoke" installment to life at this year's " Halloween Horror Nights" event, beginning Friday, September 15, 2017. "American Horror Story: Roanoke" will unearth the twisted legacy of The Lost Colony of Roanoke, transporting guests to the haunted backwoods of North Carolina where they will experience the terror that has tormented the town for centuries. The all-new disturbing maze, reimagined in acute and disturbing details, will unmask a cast of deranged killers, from the cannibalistic Polk family who subsist by feeding upon innocent victims to The Butcher who thrives on human sacrifices. Trapped in a vicious circle of evil and murder, guests will find themselves in a life or death battle to outrun the nightmare of Roanoke before the vindictive spirits and demented killers soak the earth with the blood of their victims. "The macabre mind of Ryan Murphy brings a treasure-trove of limitless possibilities to 'Halloween Horror Nights,'" said John Murdy, Creative Director at Universal Studios Hollywood and Executive Producer of "Halloween Horror Nights." "Because of the multitude of terrifying layers that come to life within this latest installment of FX's 'American Horror Story,' we are devoting our entire maze to uncovering every twisted detail to fully immerse our guests into the Roanoke storyline." Captivating – and shocking – viewers since its debut in 2011, "American Horror Story" has won 15 Emmys, three Golden Globes, four Critics' Choice Awards and one People's Choice Award. The latest installment of "American Horror Story" returns to FX Fall 2017. "Halloween Horror Nights" at Universal Studios Hollywood brings together the sickest minds in horror to immerse guests in a living, breathing, three-dimensional world of terror. Featuring an all-new slate of unrivaled film production quality mazes, frightful scare zones and a fully re-imagined "Terror Tram" experience uniquely themed to today's most definitive horror properties, "Halloween Horror Nights" will taunt, terrorize and torment guests with spine-chilling haunted attractions as part of Southern California's most extreme Halloween experience. Updates on "Halloween Horror Nights" at Universal Studios Hollywood are available online at HalloweenHorrorNights.com/Hollywood and on Facebook at: "Halloween Horror Nights – Hollywood," Instagram and Twitter at @HorrorNights as Creative Director John Murdy reveals a running chronicle of exclusive information. Watch videos on "Halloween Horror Nights" YouTube and join the conversation using #UniversalHHN. Universal Studios Hollywood is The Entertainment Capital of L.A. and includes a full-day, movie-based theme park and Studio Tour. As a leading global entertainment destination, Universal Studios Hollywood delivers highly themed immersive lands that translate to real-life interpretations of iconic movie and television shows. Recent additions include "The Wizarding World of Harry Potter™" which features a bustling Hogsmeade village and such critically-acclaimed rides as "Harry Potter and the Forbidden Journey" and "Flight of the Hippogriff™," Universal Studios Hollywood's first outdoor rollercoaster. Other immersive lands include "Despicable Me Minion Mayhem" and "Super Silly Fun Land" as well as "Springfield," hometown of America's favorite TV family, located adjacent to the award-winning "The Simpsons Ride™" and the "The Walking Dead" daytime attraction. The world-renowned Studio Tour is Universal Studios Hollywood's signature attraction, inviting guests behind-the-scenes of the world's biggest and busiest movie and television studio where they can also experience such authentic and immersive thrill rides as "Fast & Furious—Supercharged." The adjacent Universal CityWalk entertainment, shopping and dining complex also includes the all-new multi-million dollar, completely redesigned Universal CityWalk Cinema, featuring deluxe recliner seating in screening room quality theatres, and the "5 Towers" state-of-the-art outdoor concert stage. FoxNext is driving immersive, next generation entertainment experiences in the areas of virtual and augmented reality, mobile, console and pc games and location-based entertainment across Twentieth Century Fox Film and Fox Network Group. The division consists of FoxNext Games, FoxNext Destinations and FoxNext VR Studio. Fox has a successful track record identifying exceptional games and publishing partners across the mobile and console/PC space, such as Family Guy: Another Freakin' Mobile Game, Animation Throwdown: The Quest for Cards, The Simpsons Tapped Out, Family Guy: The Quest for Stuff, Ice Age Adventures, Sugar Smash: Book of Life and Alien: Isolation. FoxNext VR Studio will oversee VR experiences, such as the already announced ALIEN and PLANET OF THE APES productions, and work to commercialize Fox's overarching VR strategy. FoxNext Destinations will oversee the company's location-based entertainment business including the development of the 20th Century Fox World theme park in Malaysia.